I had lunch with a friend, Joules Evans, author of Shaken Not Stirred: A Chemo Cocktail from my writers group and we talked about taxes and the dreaded record keeping. I tried to make it easy on her and shared this spreadsheet I created with her. Joules doesn’t need accounting software like Quickbooks to track her income and expenses. A simple spreadsheet will do. Then I had an “aha!” moment and thought I’d share it with you all, too. 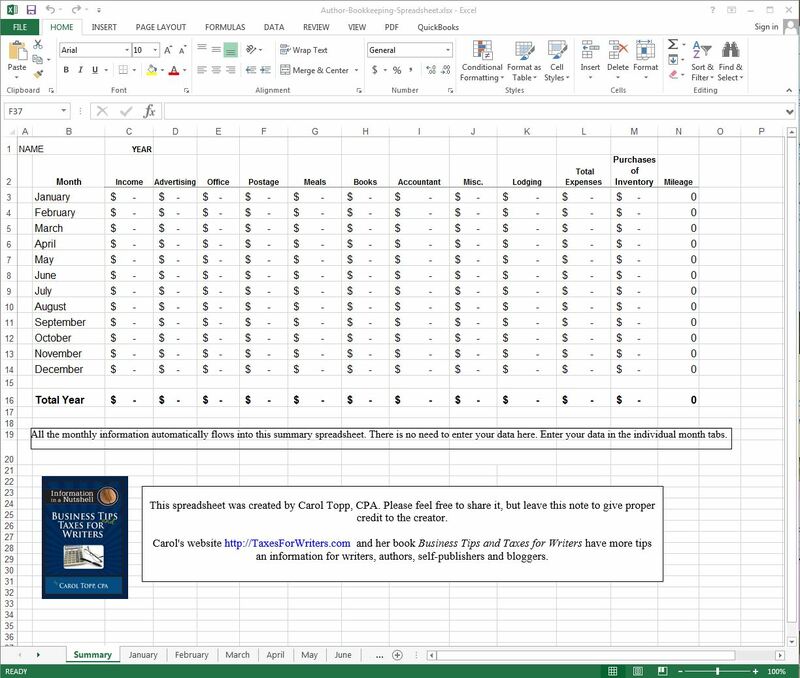 Great spreadsheet! Thanks for sharing this. Where you recommend putting in paypal fees? Misc.? I put my Paypal fees and other banking fees (like credit card fees) in a category called Bank Fees. You could put them under Misc if they are insubstantial. My fees started adding up, so I created a separate category for them. On the tax return (Schedule C of the Form 1040), I put bank fees under Other Expenses. Thank you Carol, It’ll be very helpful. Are your suggestions equally valid for those in Canada? Wendy, I’m happy to offer the spreadsheet. I’m not familiar with Canadian taxes or deductions to be able to answer your question! Sorry. I do know that good record keeping is essential in every country! Wow. What a great resource. Quick question. Putting a dollar amount into the “income” category flows into the “total expenses” category. Is that an error or am I missing something? Also, I see you have “office” and “postage” listed separately. Are they considered different categories on the tax form or do you combine them for that? Thank you for pointing out that error in the spreadsheet. I fixed it and have uploaded a corrected version. Postage (you paying to ship out books) could be included as part of Cost of Goods Sold on your tax return. I separated it from Office Expenses, just to have visibility into how much I was spending on postage. Thanks so much for this info, Carol. So glad I found your site just before tax time! Thank you, Carol, for providing this very helpful resource, and for sharing your expertise with fellow authors. Thank you so much! I have Quickbooks and they are selling and to upgrade costs $$. I hardly use any feature except income/expenses. This is absolutely perfect!